In occupational therapy we use all kinds of activities, occupations / tasks as a medium of intervention. Many but not all of them are creative activities. When I was at university, I loved to learn to do weaving, though it was not a technique that was new to me. In university we enjoyed learning to weave on a loom. Those of us taking weaving got to borrow a relatively small, portable loom which we took home in order to compete our weaving assignment. In addition to the fun part of producing a useful item (in my case a neck scarf which was given to a fellow student who was far from family), we also had the opportunity to analyze the process of weaving from every conceivable angle. When and where it was possible to adapt the activity, the loom, the weaving process, we gained insight and skills as to how to do so. As mentioned, weaving was not a new activity for me. When I was in primary school, I had a wonderful time learning how to make up a loom in a branch that had a fork in it. We added wood across the horizontal and learned how to thread the loom appropriately before weaving a creative piece of fabric. So what is weaving? 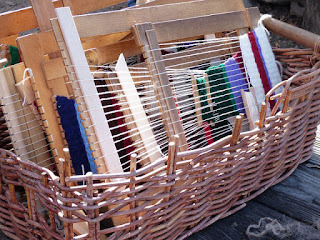 Weaving: is a means to create fabric using specific types of thread, yarn or fibre. The vertical or longitudinal threads are called the warp and the horizontal threads are called the weft. These threads are set up in such a way that they run perpendicular to one another forming a definite grid which is very recognizable. The nature of the fabric is dependent on the thickness and type of thread, yarn or fibre that is used. A woven item can become a garment or for those who weave on larger looms it is possible to weave mats, rugs, wall hangings and more. From an occupational therapy perspective, weaving has all kinds of benefits in improving upper limb function, hand function, concentration, patience, work speed, work tolerance, standing tolerance and so much more. Weaving is not only with types of threads. We also learned how to weave baskets using cane. Cane work is a very different experience to weaving with threads or fibres and the decision as to whether a client will benefit from weaving a piece of fabric or a basket or engaging in a different type of creative activity comes back to a large extent to the interests, preferences and goals of the client / patient.